Help Scout offers a help desk invisible to customers that helps companies deliver outstanding customer support. Help Scout features a knowledge base solution which is integrated into the main help desk product. 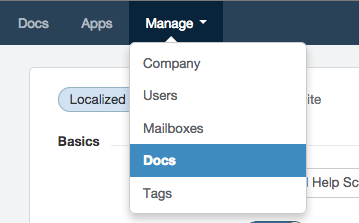 You can turn your Help Scout Docs into a multilingual knowledge base using Transifex. We have a live example of a localized Docs site at transifex-sample.helpscoutdocs.com. Use the language drop-down at the bottom right to switch languages. Below, you'll find instructions for localizing your Help Scout Docs. Before you begin, you must have a Transifex account and a project you will be associating with your Help Scout knowledge base. If you have not already done so, sign up for Transifex here. Open your Help Scout Docs settings page.